One way we stay in touch with you is through the Alumni Council. Each member represents their local area and partners with us to make sure alumni all over the country can be involved. I earned my bachelor’s degree in psychology from AU in 2011. I have worked as an Academic Advisor and Counselor at Missouri State University and I am now self-employed. My favorite things about AU are the relationships that were made with faculty and friends. My wife and I recently had a son. We are super blessed and tired! I graduated from AU in 2002 with a bachelor’s in Bible and Religion, and I earned my Master of Theological Studies from AU in 2006. I am a pastor at The Southeast Project Church in Indianapolis. When I attended AU, I loved hanging out in the valley and the conversations and debates in classes. I met my wife, Jill, at AU and we have two beautiful girls, Emily and Maggie. In 2004, I graduated from with a degree in physical education. I work as a Special Education Teacher with Hamilton Southeastern Schools. One of my favorite things about AU is the people that I met, including my wife and lifelong friends. When I was at AU, I started the Intramural Program as it operates now! I earned my Master’s of Business Administration from AU in 2005, and my Doctorate of Business Administration and Marketing in 2013. I work as the Chief Marketing Officer at Baker Hill in Carmel, Ind. I love that AU has phenomenal faculty and is a place where everyone is accepted and loved for who they are. I’ve been married to my husband, Todd, for 22 years and have a daughter (Lauren, 19) and a son (Parker, 17) and a dog (Roxy, 9). I graduated in 2001 with a degree in Marketing. I work as the Vice President at Vizi Courseware. I came to AU to run cross country and win races. But, as it turns out, I’m not very fast! Thankfully, the Lord led me to this great school for reasons I wasn’t even aware of and introduced me to students and faculty who are still a big part of my life. My wife, Sara (also an AU grad), and I have three children and we attend Genesis Church in Noblesville. I graduated from Anderson University in 1986 with a degree in Communications and Religion as well as a sociology minor. I have good memories of building long-lasting friendships that continue today with fellow students and professors. I have been married to Wendell Ford, II for 26 years, and we have two children: Jessica and Wendell Ford, III. I volunteer as a youth leader for high school senior girls at Grace-Snellville, and while I have worked in the PR field for many years, I also am a certified personal trainer and photographer. I graduated in 1991 with a bachelor of arts in Biology with a Chemistry minor from AU. I am a General Surgeon with the Gundersen Health System in La Crosse, Wisconsin. Some of my favorite things about AU are the friendships made and the spiritual growth I experienced. I am a past president of the Wisconsin Surgical Society, ASMBS Board member, ACS Governor for Wisconsin. I am married to my wife, Peg, and we have two daughters, Brittany and Samantha. I graduated from AU in 2011 with a degree in social studies education. I now work as a teacher in the Franklin Township Community School Corporation, and this is my sixth year of teaching. I was able to teach at a missionary school in La Paz, Bolivia from 2013-2015. I loved my time at AU for many reasons! I loved being able to learn in a diverse community that continually sought to improve. I also loved feeling a part of a community that genuinely cared for each other. One of my best life experiences was my Tri-S trip to Kolkata, India. Oh, and of course, Encore & Cheap Thrills, Ricker’s and Deluxe runs, and swimming in the Hartung fountain! I graduated from AU in 2009. My degree is in Marketing and Psychology. I now work with Carter Logistics as management of logistics and supply chain. My favorite parts about AU are Dativus, chapel, the community, Falls School of Business, and SIFE (now Enactus). My wife Jaime and I have a baby daughter named Remi. Graduated in 2002 with a Marketing degree. He does Music Management for True Artist Management and also started a non-profit called Restore Haiti. Philip is married and has one son. I graduated from AU in 2005 with a degree in Biology. I work at the University of Maryland in the University Career Center. Some of my favorite things about AU were the Gospel Choir, Discipleship Coordinator program, Cultural Resource Center, and my time as an RD in Myers Hall. I graduated from Anderson University in 2017 as a general study, business administration major, and I am currently working on my MBA at AU as well. I work as a graduate assistant and academic coordinator at Anderson University. During my time as a student, I enjoyed being able to build community through working in Res Life for 3 years and being fully involved in the Cultural Resources Center, especially with HLSA, and served on the MOSAIC committee for 4 years. I graduated in 1988 with a degree in mass communication/public relations from AU. I am a self-employed musician, and I have traveled with the Gaithers, Sandi Patty, and the Discovery singers, as well as doing studio singing in many area studios. I am still actively doing sessions and have also done children’s ministry and some substitute teaching at our kids’ school. My husband, Jay, and I have two awesome kids, Thatcher (22) and Londyn (17) who is attending AU starting in 2017. Some of my dearest and most treasured friendships began at AU, as well as meeting my best friend and husband of 29 years. I graduated from Warner College in 1975 and Anderson University’s School of Theology in 1977. I am Dean Emeritus of AU’s School of Theology (the longest serving School of Theology Dean, 1995-2014) and currently a minister at large. Some of my favorite things about Anderson University are the helpful faculty and and lifelong friends I have made. Kevin met Alex, his wife, during the residential MBA program, having never met in undergrad. His sister and a sister-in-law both attended AU, as well as both of his in-law parents. He enjoyed serving as Student Body President while at AU, and he considers it to be one of the most defining opportunities of his life thus far. He is a Madison County Leadership Academy graduate, 2017 Madison County 20 Under 40 selection, and he enjoys being connected to the communities he calls home. I graduated from AU in 2017 with a degree in Psychology. I am now attending Ball State University in the dual master’s degree program in clinical mental health counseling and social psychology. One of my favorite things about AU is that the community is intentional and genuine. There is no greater place for discovering yourself in the transformational love of Jesus Christ. I am also a legacy student from both sides of my family, from the very early days of Anderson College. I graduated from AU in 2008 with a degree in Physical Education/Health and 5-8 Math. I am a teacher and the varsity assistant girls basketball coach at Fishers High School and also work with the Fellowship of Christian Athletes. In my time at AU, the relationships I formed and the spiritual growth I experienced were life-altering. Those 4 years were the most transformative of my life and I am grateful I had the opportunity to attend AU! I attend Grace Church in Fishers and enjoy working with the youth there. I graduated with a degree in communication production in 2001 from AU. I work as a Teaching Pastor at North Hills Church and a University Professor at Arizona Christian University in Phoenix. I also do consulting with the company Ministry Insights. My favorite things about AU include CAB, Student Life, Dativus, and the friends I made. I am married to Nicky, and we have three kids, Justice, Holland, and Titus (and one on the way). Cindy and her husband Scott (an ’86 AU alum) have two children (one married) and one granddaughter. Their daughter Ali was a fourth-generation Kardatzke to attend AU. Music is still very much a part of Cindy’s world and she loves serving the women of her church. I graduated from AU in 1999 with a degree in social studies education. I work as the Chief Strategy Officer at the Ohio Department of Education. I loved my AU experience. As a student, I was immersed in rigorous academics, challenged to explore my faith through service and blessed to develop life-long friends. Her daughter graduated from AU in 2018. I decided to transfer to AU as a sophomore and major in psychology and marketing. I quickly threw myself into the Falls School of Business and really loved the professors there. When I think back on my time at AU, I look back at those specific mentorships and the one-on-one coaching that I got from my professors. 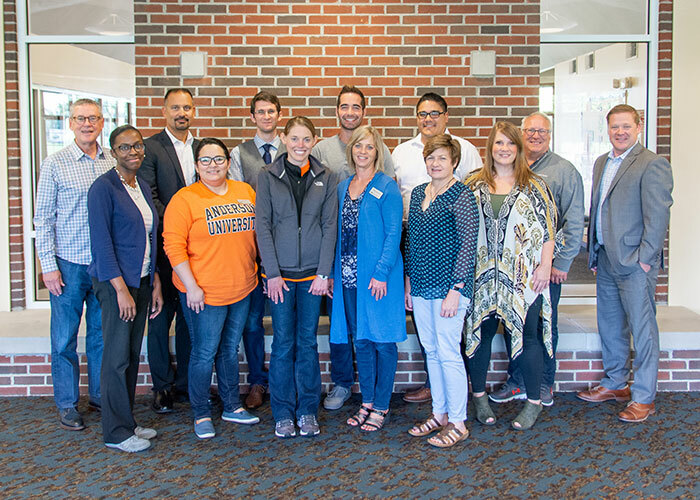 Now as a member of the AU Alumni Council I want to take this opportunity to encourage others to explore the same types of opportunities that I was able to experience at AU.